Ghada Issa, the program director for the Hope Flowers School, is trying to help change the way young Palestinians and Israelis think. AL KHADR, West Bank, June 5 (JTA) — Members of the Issa family of Bethlehem are veterans of bridge-building projects for peace education with Israelis, but this is a particularly frustrating moment for them. 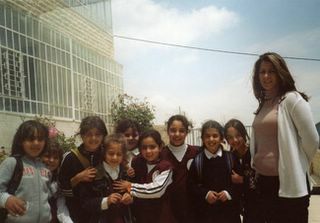 The founders and directors of the private Hope Flowers School in the village of Al Khadr, located between Bethlehem and Efrat on the outskirts of Jerusalem, the Issas currently are involved in several student-exchange and Internet-based programs with Israeli, German and French schools. They also are waiting to see if the Israeli army will demolish their cafeteria and six Palestinian homes in the valley next to the school. The buildings are too close to a projected section of Israel’s West Bank security fence, and also to outlying homes in Efrat, a Jewish settlement that sits on a hill across the rocky valley. The security fence reportedly will run through the valley. According to Ibrahim Issa, 28, the school’s managing director, the wall will pass within 120 yards of the cafeteria, and the legal minimum is about 170 yards. There’s also the fact that the cafeteria was built without a permit. “We had a permit from the Palestinian authorities, but our request to the Israeli authorities was denied when we first built the cafeteria several years ago,” Ibrahim Issa explained. Israel’s Defense Ministry refused to comment. Issa’s sister, Ghada, the school’s program director, has been busy with several programs, including Peace Trees Bethlehem 2005. That program, slated for July, includes tree planting with Israeli youths and workshops on compassionate listening, gender equality, democracy, coexistence and environmental awareness. The workshops are being organized with Israeli educators. Ghada Issa also helped organize a get-together between Israeli and Palestinian youth in May at Neve Shalom, an experimental Jewish-Arab village in Israel. It was organized by the Parents Circle, a group whose participants, on both sides, have lost family members in the conflict. Ghada’s father, Hussein Ibrahim Issa, a well-known figure among peace activists, founded the Hope Flowers School about 25 years ago. Students from six to 15 years old were taught Hebrew by Israeli Jewish volunteers working alongside Palestinian teachers, who in exchange taught the volunteers Arabic. The Palestinian Authority threatened to close down the Hope Flowers School if Issa didn’t get rid of the Jewish teachers, but he refused. Radicals from the Popular Front for the Liberation of Palestine threw a bomb at his home, but he stood fast: The school remained open and the Jewish teachers stayed, and the international media visited to do feature stories. The Israeli teachers left when the second intifada began in late 2000. Then Hussein Issa died of heart complications. Ghada Issa’s office is in the school’s main, four-story building, which includes dormitories that host rare visiting peace groups, mostly from Europe. It looks out over the ancient rocky valley with its olive trees, Palestinian homes and a tiny Israeli military base on the opposite hill, plus the outlying houses of Efrat. “My father had a slogan,” Ghada Issa said. “He always said, it’s better to suffer for peace than to suffer for war. It was true then and it’s true now. His dream was to create a generation of Israelis and Palestinians who believe in peace. Enrollment at the school has jumped to almost 200. English and French classes are mandatory, but there are no Hebrew classes and no Israeli teachers. A community-outreach program works with about 80 16-and 17-year-olds, participants in the Peace Now program with French and Israeli schools. The youngest students have never spoken with Israelis. “I would like to meet Israeli children and play with them,” said Menal, age seven. Ghada Issa is optimistic about the work at the school.